The Law now requires that a Home Information Pack (HIP) must now be provided by the seller - the cost of which is in the region of £300 to £450. Any 4 bedroom property 'new to the market' from 1st August 2007 will require a Home Information Pack by law or the person responsible for marketing the property, or the seller for private selling, will face a £200 fine for every occasion they are caught marketing without a HIP. As of 10th September 2007 this law will also apply to anybody selling a 3 bedroom property. 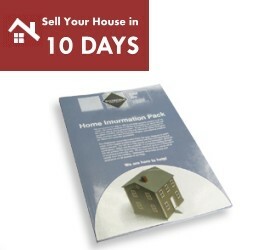 Any 3 bedroom property 'new to the market' from 10th September 2007 will require a Home Information Pack by law or the person responsible for marketing the property, or the seller for private selling, will face a £200 fine for every occasion they are caught marketing without a HIP. When selling to The 10 Days Property Company you do NOT need to provide a HIP Pack - we cover ALL the costs associated with selling your property.